Obituary for Mary (Chernesky) Krivitsky | Thompson-Marodi Funeral Home, Inc.
Mary A. Chernesky Krivitsky, 97, formerly of Ellsworth, passed away peacefully at The Donnell House in Washington on Sunday, July 1, 2018. She was born March 2, 1921, in Shenandoah, a daughter of Andrew and Stefania Bushinsky Chernesky. She worked on the assembly line at the former RCA in Meadowlands for eight years and then Magruda’s Sewing Factory in Monessen for several more. She was a member of St. Katherine Drexel Parish, the former Ave Maria Parish Women’s Guild, Finleyville Golden Agers and the Croatian Fraternal Union St. George Lodge 354 in Cokeburg, where she enjoyed performing with the Adult Tamburitzans. Mary was fun-loving, out-going and an avid card and bingo player. Her younger years were filled with cooking, baking and caring for her family. On June 10, 1939 at St. Casimir Church in Shenandoah, she married Zigmund F. “Ziggy” Krivitsky, who died on December 1, 1993. Surviving are her beloved children, Zigmund “Ski” Krivitsky of Bryans Road, Maryland, Yvonne Orsatti (Bob) of Bentleyville, Gloria Smitsky (Larry) of Burgettstown and daughter-in-law, Mary Jo Krivitsky of Clarksville. 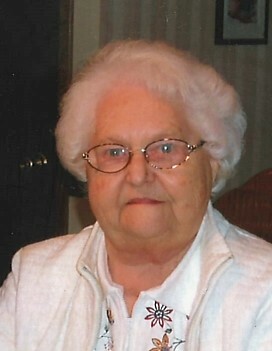 She cherished her 10 grandchildren and 13 great-grandchildren who gave her so much joy and affectionately referred to her as “Bubba.” Her surviving grandchildren are Darrin Krivitsky (Pam), Dan Krivitsky (Amber), Tiffany Throckmorton (Joe), Tara Ryan (Josh), Rob Orsatti (Kim), Jayme Williams (Chris Curry), Jennifer Connelly (Doug), Francesca Silver (Jim Pauff), Brian Smitsky (Marie) and Scot Smitsky; and great-grandchildren, Melana Krivitsky; Emily Speak; Alex and Rachel Watson; Brina and Emme Orsatti; Felicia and Ben Curry; Nick Silver; Blake, Kailyn, Katie and Logan Smitsky. Also surviving is her loving godchild, Fran Sprowls, and several nieces and nephews. Mary was the last of her immediate family. Deceased are a son, Ronald Krivitsky, who died on July 1, 2014, and daughter-in-law, Marianne Krivitsky, who died on October 29, 2016, five brothers and two sisters. Mrs. Krivitsky always referred to the staff of Evergreen Personal Care and Dialysis Clinic Inc. as her angels. This family extends our most sincere gratitude for their special caring efforts, kindness and warmth to her over the last several years. Friends are welcome from 2 to 4 and 6 to 8 p.m. Thursday at the Thompson-Marodi Funeral Home, Inc., 809 Main Street, Bentleyville, 724-239-2255, where a prayer service will be held at 9:30 a.m., Friday, July 6, 2018 followed at 10 a.m. by a Mass of Christian Burial at Saint Katharine Drexel, Bentleyville Campus (formerly Ave Maria), 126 Church Street, Bentleyville with the Reverend Edward L. Yuhas, Administrator, as celebrant. A procession will follow to Sacred Heart Cemetery, Monongahela for the Rite of Committal.